Since May 1, 2019, Publication fee will be 90 EUR per printed page of Original article and 45 EUR per a page for Review article. Additional cost for color print is 35 EUR. Editorial Office of Physiological Research would like to congratulate Prof. Tomasz Szkudelski (Poznan, Poland) for achieving more than 1400 citations for his article "The mechanism of alloxan and streptozotocin action in B cells of the rat pancreas" published in Physiological Research in 2001. Physiological Research is a peer reviewed Open Access journal that publishes articles on normal and pathological physiology, biochemistry, biophysics, and pharmacology. Authors can submit original, previously unpublished research articles, review articles, rapid or short communications. Instructions for Authors - Respect the instructions carefully when submitting your manuscript. Submitted manuscripts or revised manuscripts that do not follow these Instructions will not be included into the peer-review process. The articles are available in full versions as pdf files beginning with volume 40, 1991. The journal publishes the online Pre-Press version of the articles that are searchable in Medline and can be cited. 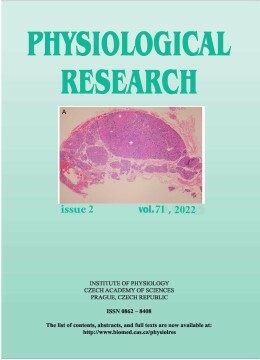 Physiological Research is published bimonthly by the Institute of Physiology, Czech Academy of Sciences, Vídeňská 1083, 142 20 Prague 4, Czech Republic.